What is ofm file? How to open ofm files? The ofm file extension is used by embroidery specialized applications for embroidery designs. Known to be used in Melco machines. The process of conversion translates the pixels in your JPEG, PNG, or GIF file into an embroidery format file containing the color and stitching information required to guide an automated embroidery machine. Our trained embroidery professionals do this transformation for you. You may, if you prefer, take your image to an embroidery specialist to have them convert it for you instead, and upload the resulting OFM format file. 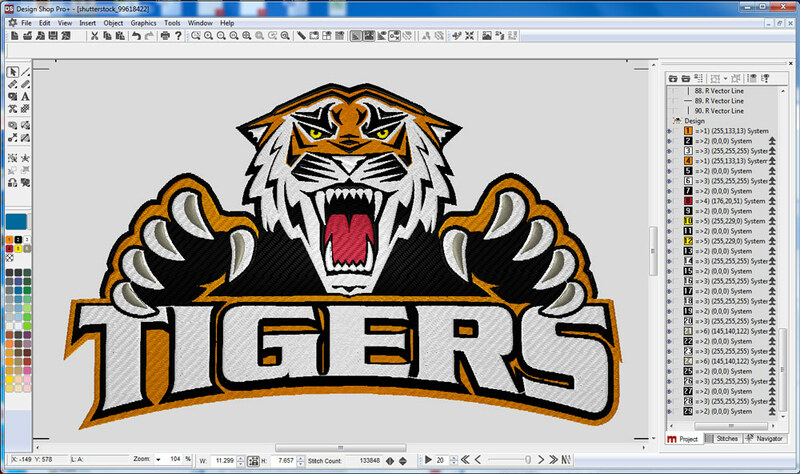 DesignShop is embroidery design software for professionals as well as for seasoned users. It is distributed in four editions: Pro, Pro+, normal and Lite. Try to use Melco embroidery applications to work with the *.ofm files. Various embroidery designs can be usually converted beztween similar formats with some embroidery tool. This is usually done in order to transfer designs from one machine to another. and possible program actions that can be done with the file: like open ofm file, edit ofm file, convert ofm file, view ofm file, play ofm file etc. (if exist software for corresponding action in File-Extensions.org's database). Click on the tab below to simply browse between the application actions, to quickly get a list of recommended software, which is able to perform the specified software action, such as opening, editing or converting ofm files. Programs supporting the exension ofm on the main platforms Windows, Mac, Linux or mobile. Click on the link to get more information about listed programs for open ofm file action. Programs supporting the exension ofm on the main platforms Windows, Mac, Linux or mobile. Click on the link to get more information about DesignShop for edit ofm file action. Programs supporting the exension ofm on the main platforms Windows, Mac, Linux or mobile. Click on the link to get more information about Embroidermodder 2 for convert ofm file action. Programs supporting the exension ofm on the main platforms Windows, Mac, Linux or mobile. Click on the link to get more information about DesignShop for create ofm file action. Click on the software link for more information about DesignShop. DesignShop uses ofm file type for its internal purposes and/or also by different way than common edit or open file actions (eg. to install/execute/support an application itself, to store application or user data, configure program etc. ).